Plenty of people, including Ed Dale and Mark Thompson, have been talking up this book and its author so I was expecting something really good. The paperback version costs $17.96 and the Kindle version retails at $4.99. I bought the Kindle version. They both look the same but I couldn’t vouch for that, never having seen the paperback. My first impressions were that it’s a nice easy read and well laid out with lots of screenshots. But there’s not actually very much in there, and what there is tends to be a bit superficial and in some cases not particularly accurate. I read this book from cover to cover in less than 20 minutes and didn’t come away feeling as though I’d learned anything of substance. I suppose this might be a good book for a complete newbie who wants to buy a website but hasn’t a clue about where to start. Let’s have a closer look. In the book’s introduction, Gessner gets straight to the point – when buying a website the key factor is to reduce the risk. He then goes on to say that you can reduce risk by gathering information about the site and how much of the information is publicly available. He doesn’t actually use the term ‘due diligence’ but that’s what he’s talking about. Next he explains how to have confidence in the numbers, and that screenshots cannot be relied on. So far, so good. The book will talk us through a step-by-step process of how to understand the figures and know what’s believable. Then his and my opinions start to diverge because he is placing such a high priority on traffic. Yes, I agree that traffic is important but I personally would be looking to analyse and verify the income first. He outlines some traffic-related terms, such as visits, uniques and bounce rate. This could be useful for a newbie, and it’s all attractively illustrated with screenshots demonstrating how you can get this information from Google Analytics (GA). He explains that ideally you want traffic which is consistent over a period of time or growing, and warns the reader to look out for seasonal traffic or short-term spikes. If GA is not available, as is often the case, you can use an alternative such as AWStats although it tends to overstate the figures because they include bots. He also touches on the sources of traffic, suggests looking at keywords, warns about any over-reliance on any one thing which generates traffic, and he lists several factors to look at to reduce the risk when analysing traffic. It’s good stuff if you were coming to this brand new but for anyone with even a little bit of experience of buying websites, it’s really very basic. By the way, he also briefly explains about short-tail and long-tail traffic, but he defines long-tail as being the number of words in the search phrase. Well, I don’t agree with that because I define it as the obscurity of the search phrase. Of course the two are correlated but long-tail is a lot more complex than he explains, and he’s only briefly touched on the surface. Another thing I disagreed with is the way he refers to organic traffic as being “free”. This is my number one Google myth. Organic traffic is not free. Now he’s looking at the number and source of the links into the site. Yes, it’s useful and necessary to check a site’s link profile, not least because of Google’s Penguin algo update and their war against “unnatural linking”. It’s good as far as it goes, but once again, the content of this book is very superficial and probably suitable for only the rawest rookie. He does, however, explain the “comment roll” which is related to the blog roll. I must admit to not having heard of “comment rolls” before – although I was aware of the concept, just not that particular term for it. It’s nice to learn something new. But we’re half-way through the book by now and Gessner hasn’t really said anything beyond the most basic beginner’s level. Here we get a brief overview of some sources of income such as AdSense and affiliate commissions. Once again, we’re looking for consistent or growing income over a period of time. He reminds us to factor in costs to our assessment and provides a table of costs which might be involved, such as hosting and advertising. Next, he moves on to how income can be verified and explains the problems involved including that of faked screenshots. He makes a few useful suggestions of steps you can take so you have more confidence in the figures. Gessner explains that we need to understand the site and the domain as well as verify its ownership and history. He gives a very brief overview of checking the ownership – look at Whois. Next he suggests that CopyScape can be used to make sure the content is unique. You can also use the Wayback machine to check the history of the site. There’s nothing wrong with this information, it’s just that it’s very much over-simplified. The chapter concludes with some extra pointers to reduce risk on the content side of things. This starts with an explanation of Google PR and how to spot if it’s been faked. Also check the age of the domain and the links. He reminds us that screenshots are easily faked. Also AdSense accounts could consist of cumulative figures for more than one account. Then there’s a bit about “rebirthed sites”, ie people trying to rebuild sites on dropped domains. As with everything else so far, it could be useful for the complete newbie. He suggests that you can ask the seller for access to the Google Analytics for the site, or they can send you screenshots. There are some checks you can do and he describes some of them but doesn’t touch on some of the more sneaky tricks that unscrupulous sellers get up to. Next he describes some ways to check up on the seller – mainly by looking at their profile on Flippa. This covers how to pay for and transfer the site. This book was a nice quick read: well written and presented without any hype or overt sales pitch. There’s a link to Martin Gessner’s website at the end, which is perfectly acceptable for any author. 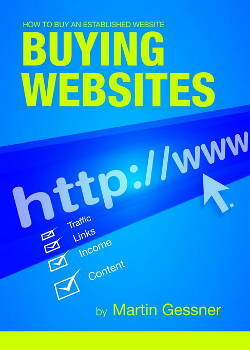 I didn’t spot any of the affiliate links or upsales that are so prevalent in many books in the make money online niche. All in all, I quite liked the book but think it’s only suitable for a complete newbie who really doesn’t know anything at all about buying websites or verifying traffic and income. In my opinion it’s far too simplified, even for relative newbies. However, some people do like things to be as simple as possible so I’d recommend this book for those people. I’m curious enough about the author to visit his site and see what else he has to say.